The whirlwind chain of events over the past eight months that took The Orioles from a newly formed amateur group in March to making their public debut on a national radio show six weeks later to cutting their first record by defying the musician’s union recording ban six weeks after that and now, as we speak, seeing that record top the Race Charts in Billboard, was the type of story Hollywood rejects for being too contrived. Who would believe such things could actually happen? But of course it had happened. In the last week of November 1948 It’s Too Soon To Know was the #1 record in black America and The Orioles were the new poster boys for rock ‘n’ roll stardom. That was the EASY part… well, not easy in terms of beating the incredibly long odds themselves, but easy in that these events just seemed to happen TO them, almost as if – the singing of the songs aside – they were somehow just innocent bystanders in all of this. From this point forward though everything they did came with expectations. What nobody likely expected though was this… the first rock Christmas song, one that would become a standard in its own right, still heard one month a year well into the 21st Century, yet something which nobody at the time thought of as more than a timely curiosity at best. How do you follow up something that was such an unquestioned success? It’s Too Soon To Know had met with a response that was immediate and overwhelming and nobody involved had seen it coming. Heck, it hadn’t even been the A-side of their debut but now it was defining them to the public and the group themselves had to take that into account. The Orioles had only been together a few months and had very little time to work out their own style, to woodshed and see what fit them, what they liked, what they felt worked and what they wanted to avoid. There hadn’t been many gigs they played to try out a lot of different things for different audiences and gauge their response, tweak it a little and see if the response was the same, better or worse. What they had instead was one record, one HIT record, and now the reaction to that song meant they had those decisions essentially made for them. There’d be less room to experiment, or so the thinking went. Throwing their fans a curveball now wasn’t an option. If listeners had responded so strongly to a tender heartfelt ballad then tender heartfelt ballads is what they’d get from now on. Unfortunately, as we’ll see over time, that was ALL they churned out for years, some of it quite good, but ultimately it became very repetitive. That’s the danger of having such a big hit to start things off, especially in the days before artists themselves exerted more control over their material. You had a tendency to go to the well over and over until it eventually ran dry, by which time it might be too late to seek sustenance elsewhere. Here the responsible parties were Jubilee Records head Jerry Blaine and the group’s manager/songwriter Deborah Chessler who were guiding their careers and the decision to release something in the same milieu probably didn’t take half as long as deciding what kind of sandwich to order for lunch. So, with little say in the matter, The Orioles cut more of the same and with their next release on Jubilee 5001 in November 1948 they gave the audience that was now responding with such fervor to the group’s debut exactly what they expected on the A-side. But THIS song ISN’T the A-side. That alone should tell you how unpredictable this whole record business is. We’ll look at To Be To You, Chessler’s handcrafted follow-up, soon enough, but suffice it to say that didn’t draw any interest. What DID was the B-side, It’s Gonna Be A Lonely Christmas, something that was little more than a timely seasonal offering, maybe even chosen so as not to “waste” another potential A-side out of the small array of songs they’d been coming up with. Yet their growing legion of fans took to it like it was a hand-wrapped gift delivered by Sonny Til himself. When recently reviewing The Ravens appropriating two Christmas tunes, one sacred, one secular, both absolutely revered compositions, what stood out was how shocking they must’ve been for many listeners at the time who were used to hearing far more traditional – respectful – renditions. Whether fans of The Ravens, or ardent opponents of them and all of rock in general, the immediate reaction, the utter surprise in hearing songs like White Christmas and Silent Night being done this way, was probably universal. They weren’t the types of performances that were going to leave any listener neutral. Once that initial astonishment at what you were hearing passed then the two camps were at odds over the ramifications, with one side claiming it was blasphemy and the other heralding it as the sign of a new frontier. But here we have something entirely different to contend with because this composition was not a beloved standard when The Orioles cut it and as such it’s the first Christmas record to be widely introduced BY a rock group. Its success meant that rock ‘n’ roll took one more emphatic step towards legitimization. It’s hard to know how much thought went into this. 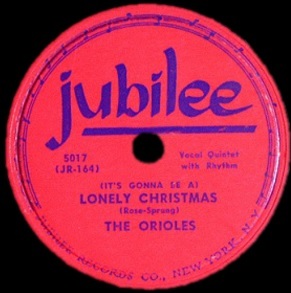 It’s Gonna Be A Lonely Christmas wasn’t written by Chessler, but its sentiments, pacing and structure were tailor made for The Orioles. Slow, almost ponderous in tempo and fraught with unbearable emotion for Til to wring from his tortured soul, this played into all of the same conflicted feelings that they’d expressed last time out, yet because of its unique theme it doesn’t come off as sounding like an ill-conceived sequel or a blatantly warmed over retread of their last outing. Yet if they HAD wanted to merely tap into everything they did so well last time around they couldn’t have chosen a better way to do so. Each of the components necessary to achieve the same response are here, most crucially the lyrical introspection which conjures up an image of Til in a sparsely furnished apartment, the Christmas lights outside his window sparkling while he sits alone, ruminating to himself about his predicament brought about by his recent breakup. We never find out what caused him and his sweetheart to part, presumably it was her decision, but whether it was brought about by his actions or merely her changing views of their romance isn’t even hinted at, but we sympathize with Sonny because he’s showing such naked vulnerability, something he does better than anybody. If girls everywhere had wanted to reassure him after hearing It’s Too Soon To Know, here they were going to want to wrap him in their arms under the mistletoe and leave no doubt they’d be with him forever no matter what the object of his affection in the song did to break his heart. Sonny delivers it all with a halting voice, almost trembling at times, the pauses along the way as he works through his grief adding to the melodrama, all of it showing what a consummate actor he was from the very start. You believe him because HE seems to believe in what he’s singing as if it were happening to him as we speak. The music from the party ACROSS THE HALL! When his voice throbs at the end of that line you practically can hear the muffled buzzing merriment through the walls which makes his heart feel more isolated than ever. It’s a bravura performance, one that – in spite of its despondent nature which always can threaten to wear thin over time – never seems to lose its effectiveness. Maybe that’s because we hear it only in certain circumstances (and admittedly, writing this in August takes a little effort to put yourself in the right frame of mind), but there’s an authenticity to it that very few singers we’ve come across to date have been able to top. Though we stand by the claim that all involved did The Orioles no favors by sticking so closely to the same melancholy ballad approach for so long after this, it’s kind of understandable when listening to how completely riveting he is when pouring his heart out like this. What’s holding it back – ever so slightly – from matching the perfection of their debut is the relative ineffectiveness of the George Nelson sung bridge. It’s not that Nelson himself sings badly, but rather his appearance breaks the spell that Til had worked so diligently to establish. It is the one bit of evidence that this is a staged play, not reality. They’d used the same technique on It’s Too Soon To Know where the sudden change seemed more dramatic but now it was already at risk for becoming formulaic. What’s really unfortunate is there were multiple options that could’ve raised this to unprecedented heights. Imagine in its place a hauntingly languid tenor sax solo shrouded in echo providing a moody atmospheric underpinning to Sonny’s despair. Or if you want to get really creative record the other Orioles and some female companions in purposefully murky fidelity to act as the gathering across the hall as Sonny suffers through it in silence before returning to the forefront with a moaning refrain. Of course unlike us they didn’t have seventy years to come up with alternatives. It was doubtful they had even seventy minutes to work out an arrangement, thus one doesn’t have to be in the holiday spirit to cut them a little slack, especially since this is so remarkable otherwise. Christmas songs are a bit of an oddity by nature, a sidetrack to an otherwise fairly predictable career arc. Usually their appearance comes along a bit later, after an artist has gotten themselves more established, a third or fourth year gift to fans which often is little more than a hastily recorded stopover to bridge the gap between more meticulously crafted output. In other words it’s definitely not something to BUILD a career on in its early stages. Because of that I can’t imagine that they had any idea this would be something that would take off. It might not have been viewed as a little regarded afterthought, but I’d be shocked if any of them had high hopes for this commercially on its own beyond merely thinking they might get a piggyback hit if the top side did well. Its release was entirely circumstantial. The timing of it made it appropriate to put out now, nothing more. As well as Til sung it, as much as it fits in with his budding image of the quintessential lovelorn figure, this couldn’t have been a planned career move to position them in a certain way going forward. If the success of their first record had been a surprise, this was even more so. But when this became the unexpected hit side it seemed they could do no wrong and it further established The Orioles as the defining group of this generation coming of age. Now there have been some who’ve suggested that it wasn’t MUCH of a hit, its two weeks in the Top Ten seeming like something of a minor entry when compared to their previous outing which spent 17 weeks on those charts (and subsequent hit which lasted 26 weeks… shhh, you didn’t hear that from me, pretend you’re surprised when we get to it down the road!). But to claim it was somehow a lesser success is being purposefully ignorant of the circumstances. It’s Too Soon To Know took time to build a response and had been out for almost two months before it first charted and finally peaked sixteen weeks after its release, whereas this was just a month old when it broke through. Furthermore when It’s Gonna Be A Lonely Christmas hit the charts it was in fact Christmas Day already, or at least the week OF Christmas in Billboard’s survey. It peaked immediately because that’s when the narrow window for Christmas songs existed. Two weeks was about all it could be expected to last, because no matter how great a song it may be there wasn’t much relevancy left come January, let alone February or March. But the enduring popularity of this was seen the following Christmas season when it charted again as a re-release and in the years to come it continued to be pressed by Jubilee (see the 1950’s era pink label release) as they knew they could expect to get solid sales each December. 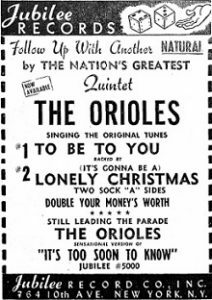 Though The Ravens beat them to the punch – just barely – with a Christmas record, The Orioles, in part perhaps by virtue of this being an original, had the distinction of claiming the first Christmas song in which the definitive performance was done by a rock act. Even today, though its been recorded by a lot of artists over the years, the version which is most well known remains The Orioles. Rock’s first year was precarious for many reasons, from the uncertainty of the style’s lasting appeal to the tumultuous nature of trying to maintain momentum in the midst of a recording ban, but now as 1948 was coming to a close there were inarguable signs that the music was here to stay. Foremost among them were the fact that audiences were gravitating towards the same artists, seeking out songs that built upon one another, and now more and more their expectations were being fulfilled, sometimes intentionally, sometimes almost by chance. The Orioles had succeeded thus far with two songs that spoke to very specific viewpoints which served as the emotional flip-side to what was most prominent in rock to this point. That neither of those songs were what they themselves, or at least those around them, had anticipated as their strongest potential sides only showed that it was truly the audience who was steering rock’s course with a firm hand and an intuitive knowledge of what was most needed for the time. Christmas time required Christmas songs, ones that weren’t meant for the older gentry, the families sitting around the fire, but rather those still navigating the often treacherous road towards finding someone to spend Christmases with, now and in the future. Until you do find that person the holidays – with all of their inescapably packaged joy surrounding you – are often when you feel most alone. Now the generation who were fervently listening to The Orioles and to a musical movement that seemed to be speaking directly to them, knew for certain that they weren’t alone. They were all in this together. Firstly, this review was beautifully written. I simply must applaud your ability to both (1) excellently describe to us the era of the record in question and (2) help us determine the importance of the record to rock-and-roll’s seventy year history. Secondly, I love this record. But of course, a song like this would be special to a fellow who’s had a couple of lonely Christmases. All of that comes before I even consider Sonny Til’s tender-hearted performance. An “8” feels like the perfect score to me. Thank you, Newt, that means a lot, especially since this was a review I had the most trouble with. Normally I sketch these out well in advance, then as I get closer to the release date I go back and tighten them up, make some corrections, etc. and when the release date arrives I can just post it. With this one though I dropped the ball, marking it down as being written but then when I opened the file found that I’d barely started it – I had no larger theme mapped out, no review of the music itself, no grade, nothing but a few random (and far-flung) thoughts. Having waited until the day before it was going to go up to even look it over I panicked and tried coming up with something in a hurry but kept drawing blanks. I’d start it, get a few paragraphs in, then erase it all. The harder I’d try the worse the results became. In the process two days went by with no posts and I had visions of the site going dark until Christmas thinking it might take that long for inspiration to strike. Finally I just scrapped all of the usual planning and rough sketch approach and sat down and wrote the review in one feverish rush, posting it immediately before I had a chance to change my mind. So I am thrilled it is even coherent let alone one you’d single out as being “beautifully written”. The funny thing is of course is that all of this happened with a great song that’s hardly in any danger of being forgotten and so theoretically should’ve been one of the easier reviews to write. 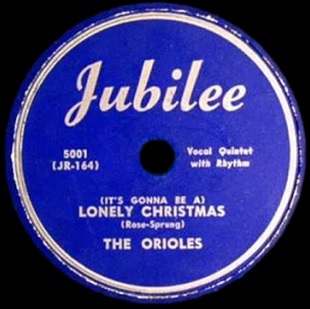 Leave a reply on "The Orioles: “(It’s Gonna Be A) Lonely Christmas”"